With the numerous advances that have been made in treatment of heart disease over the past 20 years, physicians are now emphasizing more than ever the prevention of heart disease. 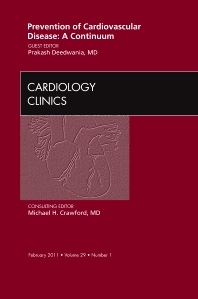 This issue provides cardiologists with practical state-of-the-art information on prevention that can be be easily applied to their patients. Topics covered include diabetes, lipid-lowering therapy, RAAS blockade, emerging therapies for atherosclerosis prevention, and heart disease in women.